The beautiful Europe Hotel and Resort is the perfect place to escape and unwind before your baby arrives. 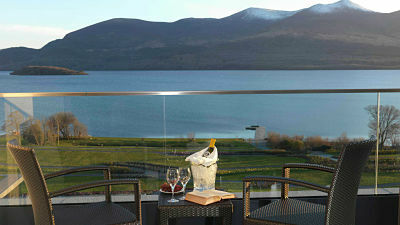 Overlooking the Lakes of Killarney, the hotel offers 5 star luxury and breathtaking views of the Kerry Mountains. Each classic, opulent bedroom is tastefully furnished and all rooms enjoy hotel garden or lake views. Mens Purifying Facial, Shoulder and Scalp Massage OR a 50 minute deep muscle massage for daddy. Castle Leslie Estate is located in Glaslough, Monaghan and is considered one of Ireland's finest Castle Hotels. Surrounded by some of Ireland's most beautiful scenery, it makes an excellent base for touring the local attractions, or a luxurious retreat to simply relax and unwind. Steeped in history and on the shore of one of the most beautiful peninsulas in Ireland, the 4 star Redcastle Hotel is surrounded by breathtaking scenery. Relax, unwind and enjoy the superior hospitality and comfort the hotel has to offer, whilst taking in the stunning view of Lough Foyle. With a range of services available at the luxurious spa, plus on-site golf facilities for the daddy-to-be, the hotel offers everything a babymooning couple may wish for! 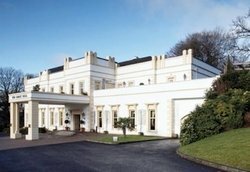 The Galgorm Resort and Spa is located just 30 minutes from Belfast and is the perfect getaway retreat, with luxurious accommodation and a Spa for a complete pampering experience as you await the arrival of your little one. Situated in 163 acres of lush parkland, the hotel has a contemporary style with a focus on quality, allowing you to enjoy the facilities and local attractions (including fishing for the dad-to-be) in unsurpassed comfort. 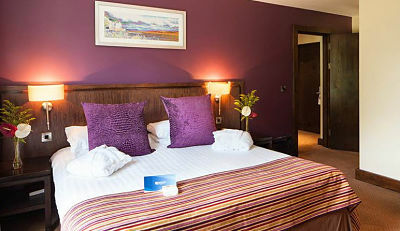 The resort offers a fabulous "Babymoon Package", which includes an overnight stay in a Deluxe guestroom, and full Irish breakfast the next morning. You can pamper yourself with the Ultimate Rose Pregnancy Treatment for the Mum to be and the Celtic Sauna Ritual for the Dad to be. At the end of the day you can enjoy a three course evening meal in Gillies Bar & Grill or Fratelli Ristorante, then relax in your room for some TV time with a selection of sweet treats. Ireland babymoon package features subject to change. Please verify features directly with the facility at the time of booking.